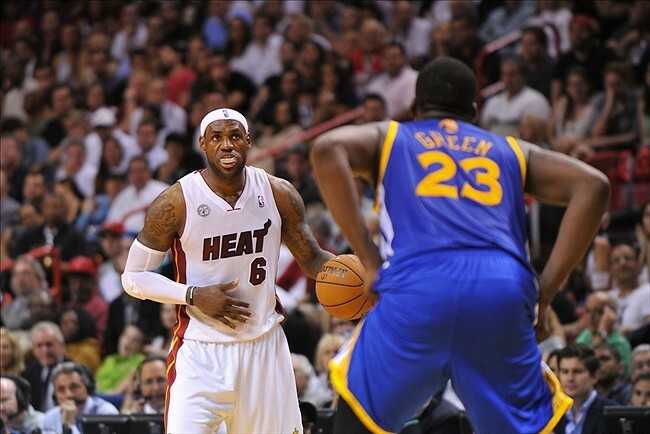 Draymond Green Defends Like LeBron James? Draymond Green’s versatility on defense has prompted head coach Mark Jackson to compare him to perhaps the best player in the league: LeBron James. Green is in fact a unique player because of his size and quickness. At 6’7’’, the former Michigan State Spartan has the ability to guard every position on the court, and that’s a product of his competitive spirit. A genius as far as basketball is concerned. A coach in the future, a winner, competes and is a no-nonsense guy that was a leader the day he walked into our locker room. That’s incredible praise to bestow on a rookie, but Green certainly earned it. 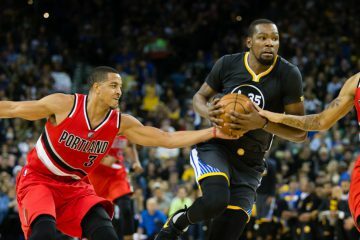 He demonstrated enough tenacity and intelligence on the hardwood for the coaching staff to feel completely comfortable with putting him on Carmelo Anthony during a regular-season contest, and also, when Andre Miller was busy torching the Dubs in the playoffs, Jackson turned to Green to drop a bucket of ice onto him (with mixed results). Again, this was during his freshman season in the league. 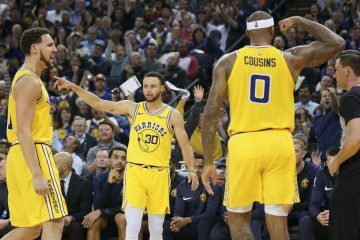 Green was abysmal from the field last season as evidenced by his 32.7 percent field-goal shooting, but Jackson still felt comfortable throwing him out there for 13.4 minutes per game because of his individual defense coupled with his understanding of the Warriors scheme. Green worked during the past offseason to refine his jump shot and improve his marksmanship from the field. It could still be better (39.6 percent), but Green is making a fair enough of amount shots to justify increasing his minutes to 20.5 per contest. With that said, the added playing time is not a product of his offensive skills, but rather his defensive brilliance. Green has been slowing down both bigger and smaller players, and he hasn’t been shy about letting them know about it either. Earlier in the year, he got underneath Blake Griffin’s skin, and last season he was quick to challenge LeBron James of the Miami Heat. That confidence is not without merit. 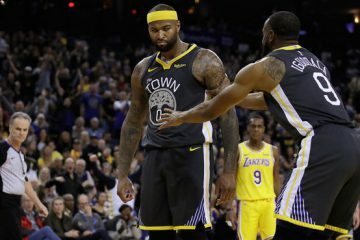 Golden State yields 98.1 points per 100 possessions with Green on the hardwood per NBA.com’s advanced stats tool. For the sake of context, that figure puts the Warriors in the same conversation as the Indiana Pacers and Chicago Bulls. This partly explains why Jackson mostly plays Green in the fourth quarter more than any other period per NBA.com. He does a great job in his individual matchups, and Green is also quick to bail out his teammates when they get beat. It’s earned him trust from the coaching staff and teammates. However, one still finds it difficult to put him in the same stratosphere as the four-time league MVP as a defender. James is the guy that practically clobbered Derrick Rose with the Maurice Podoloff trophy during the 2011 Eastern Conference finals. James covered Rose in the fourth quarters of the series and basically completely disrupted the All-NBA 1st team performer. Those two guys have the size, the strength, the knowledge, the competitive spirit in my opinion to do that. The immediate question that comes to mind after that quote: Is Jackson right though? An average player boasts a PER 15.0. Thus, any figure inferior to that number is a technically a plus. Green has done a fine job defensively at most positions he’s defended. Green has barely defended any 2-guards this season (incredibly minimal amount), which explains the lack of actual data there. At the other positions, he has been quite good. Small forwards tend to experience issues with Green, while power forwards and centers are slightly above average against him. This certainly gives credence to the idea that Green can defend multiple types of players at a high level. On the flip side, LeBron appears to be on a different level. It might be hard to believe that this is the same guy who drew Defensive Player of the Year buzz last season, but James’ work on the defensive end has fallen off dramatically. That’s why I should be Defensive Player of the Year. No one has ever done this before. James has defended centers this season, but the amount of times he’s done it is negligible. Indeed, the two-time Finals MVP has spent right around 1 percent of his minutes this year matched up with guys at the pivot. Nonetheless, he’s been impressive defensively as far as keeping players under wraps statistically. And really, that’s where the difference between James and Green lies. James’ is perhaps a better defender than Green even when he is coasting. At his best however, the two-time champion is peerless. James’ agility, strength, quickness and smarts make him a devastating defender. James covers an incredible amount of ground when rotating defensively, and disrupts plays by swarming to the ball and blowing up sets. Green is as smart as they come, but he is still a second-year player. Furthermore, his athleticism simply does not match up with James’, which partly explains why he commits more fouls per 36 minutes (4.8) than the two-time All-Star Game MVP (1.7). James gets to spots much faster than his counterpart, but it’s worth noting that the future Hall of Famer is extremely judicious in terms of avoiding fouls because of the substantial responsibilities he carries for the Heat. Jackson was right when he said that Green and James share the ability to guard all five positions, but he failed to acknowledge that they perform at different levels. One day, Green might very well earn a spot on the All-Defensive 1st team, but that will require a drastic fall off from LeBron.